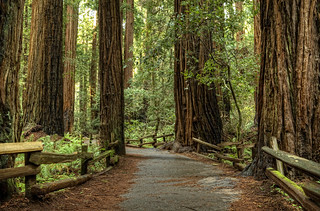 A treelined path through Muir Woods. I'd been to Muir Woods several times in my childhood but the last time I was there I can't recall. I was inspired to return after watching the Ken Burns series The National Parks: America's Best Idea on PBS. Muir Woods, is the nation's sixth national monument but the first that was created from private land (the land was donated by William Kent). The woods are home to Coast Redwood trees (Sequoia sempervirens) which can grow to over 370 feet tall and 26 feet in diameter. I think Muir Woods is one of the most beautiful places on Earth. If you're ever in the San Francisco Bay Area, I highly encourage you to visit it. You won't be disappointed.